Posted on Nov 4, 2014 by Appleton Downtown Inc.
On November 12, 2014, the History Museum at the Castle will unveil an exhibit that will truly be a feast for the eyes! Neon: Darkness Electrified features 30 vintage neon signs from the collection of Jed Schleisner (Greenville, Wisconsin). As the owner of GloTubes, Jed is one of the last working neon sign artisans in the Fox Cities and has restored many of the iconic signs that remain in the area. The exhibit will illuminate the science and technology behind the signs, as well as explain neon’s advertising and social history. Visitors will see signs dating from the early 1930s through the 1960s from both locally-owned businesses and national brands. Featured signs include Dogs ‘n Suds, Admiral Radio, classic beers like Schlitz, International Harvester, and even a Chicken in the Rough sign from Route 66. Two of the signs tower over the gallery reaching 12 feet in height. Several have moving parts and twinkling lights, including a sign from Hammond, Indiana, with 150 flashing bulbs. Volunteers have painted the entire gallery black, creating an amazing, once in a lifetime experience to see these large glowing signs at eye level. Inside the exhibit, children will be able to design their own neon-colored sign on a black light dry erase board and try forming tubular words with a rope light. Visitors can watch a video of Jed in his workshop explaining the sign-making process. There are also opportunities for schools to visit the exhibit with additional activities that explain the science, history, and art of neon. Though few vintage neon signs remain in downtown Appleton, College Avenue was once bright with the glow of neon. The exhibit will also display photos of the neon signs that once lit up College Ave, and explain neon’s rise and fall as an advertising medium. 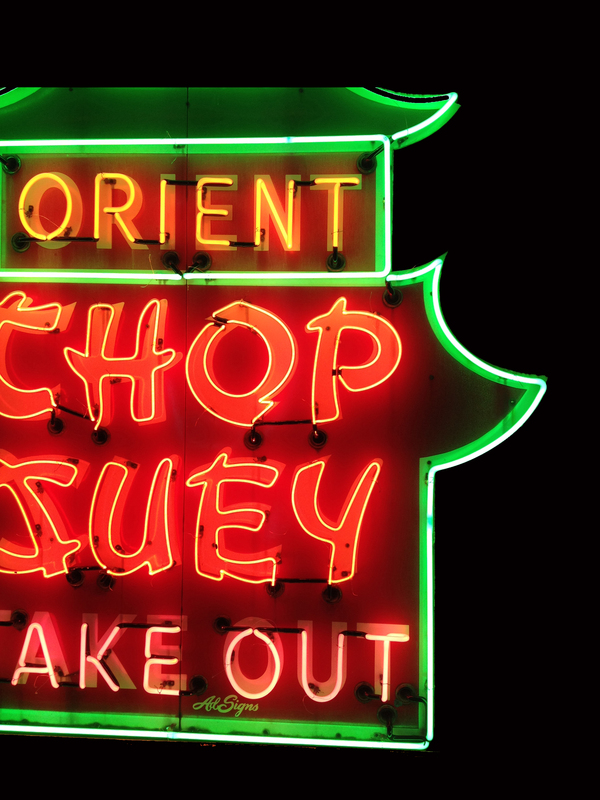 Yet, as this exhibit proves, vintage neon signs are now experiencing resurgence in popularity thanks to popular television shows like American Pickers.